Former head of the Brooklyn Heights Association’s Landmarks Preservation Committee speaks about his involvement in the efforts to save Empire stores and Radio City Music Hall. Joseph Rosenberg moved to Brooklyn Heights in the early 1970s and became head of the Brooklyn Heights Association’s Landmarks Preservation Committee. In this 2010 interview conducted in conjunction with Pratt’s graduate program in historic preservation, Rosenberg describes his experiences as a preservationist in Brooklyn Heights and the broader city. He talks about his involvement in the preservation of the Empire Stores and the relationship between the Brooklyn Heights Association and the Watch Tower Society (Jehovah’s Witnesses), a major property owner in the Heights at the time. Q1: This is Inna Guzenfeld and Soonyoung Moon interviewing Joseph Rosenberg about preservation in Brooklyn Heights in the 1970s. Today is March 26, 2010. Let’s get started. I was surprised to discover in my research that you did not begin your career in preservation. How did you get involved in the preservation field? Rosenberg: Well, I was in medical biochemistry and the thing that brought me to New York was post-doctoral research at the Albert Einstein College of Medicine. We were living right near the hospital in northeast Bronx and when my internship was finished, we had decided we wanted to stay in New York because we had originally planned to just be here for a year and a half but we really loved it so we wanted to stay. We started looking for a place to live in Brooklyn Heights. We had been living in Philadelphia where I went to school and we loved Center City, Philadelphia, the historic houses and Brooklyn Heights was just like it. Q2: This was you and your spouse? Rosenberg: Yeah. So we moved to Brooklyn Heights and I wasn’t involved in preservation but I was getting more and more interested. I was always interested in historic theaters but I wasn’t interested in historic districts. Then one time—this was in the early ’70s—at that time a number of restaurants in Greenwich Village which was an historic district that had outdoor eating spaces were starting to enclose the eating spaces into an indoor café, like you see when you walk down Columbus Avenue. Anyway, this was happening in the Village and these would have to go before the Landmarks Commission [New York City Landmarks Preservation Commission] and the Landmarks Commission would say yes or no but a restaurant had never done this in Brooklyn Heights. There was a Greek restaurant named Mr. Souvlaki that had decided to put an application before the commission to enclose their outdoor eating area. I had no relationship with the Brooklyn Heights Association but I went down as an individual to the Landmarks hearing and I gave a passionate speech why they shouldn’t approve it. Then someone from the Brooklyn Heights Association [BHA] came up to me and said, “You know you really did a good job, but I just want to warn you that the Landmarks Commission has never turned down an application, they’ve always approved applications like that, so if the Landmarks Commission approves this don’t be disheartened.” Anyway, the Landmarks Commission turned down the application and then the Brooklyn Heights Association asked if I would get involved in their preservation committee and I said yes. That was what got me involved in preservation. Q2: So just to get a sense of the timeline, you came to Brooklyn Heights after it had been designated? Rosenberg: Right, by the time I arrived in Brooklyn Heights there’d been a number of designations, Brooklyn Heights, Greenwich Village. SoHo hadn’t yet been designated, the Upper West Side hadn’t been designated, but let’s say there were maybe ten historic district designations, I’m not sure how many. Q1: How long did you live in Brooklyn Heights? Rosenberg: Well, I moved there in seventy—probably ’73, and then in the late ‘80s we continued living in Brooklyn Heights but we didn’t really own our apartment, it was subsidized housing for middle income families—Cadman Towers. We didn’t own anything, so we were starting to get herded income tax time. We didn’t own an automobile and we decided we should buy an apartment but we wanted to stay in Brooklyn Heights, so we bought a studio in Hell’s Kitchen at a time when Hell’s Kitchen was not the nice neighborhood it is now. But we kept living in Brooklyn Heights and we didn’t leave Brooklyn Heights until 1993 when we moved to the Osborne, which is in Midtown Manhattan. Q2: So you only lived in Cadman Towers the whole time you were there? Rosenberg: Yeah, which was ironic because it’s a new building it’s a nineteen—well, we were the first people to move into our apartment. And it was a wonderful deal. we had a marvelous two-bedroom apartment and in Cadman Plaza it had be in cash but we paid $3,000. We could sell it years later for the same amount of money so we couldn’t make a profit but it enabled us to buy a new apartment. So we lived in a new building, but it was always the shame of living in a new building yet being involved in preservation in Brooklyn Heights. Q2: When you came to the Brooklyn Heights Association, were you familiar with any of the people who were part of it? Rosenberg: I knew nothing. They asked me to get involved and I didn’t know who was asking me I don’t think I really knew the organization existed. Q2: Who did you end up working with there, just names of preservationists that stand out? Rosenberg: Well, eventually I became head of the Landmarks Preservation Committee within the Association and the most active person who probably still is was Otis [Pratt] Pearsall and he was my mentor. Q1: And you worked for BHA for about ten years? Rosenberg: Yeah, I would say probably about that. Q1: Can you tell me about your most memorable project? Rosenberg: Well, probably the one I think about most is—underneath the Brooklyn Bridge between the Brooklyn Bridge and the Manhattan Bridge are some warehouses that were built in 1860s called the Empire Stores and they were owned by Con Edison. Con Edison announced that they were going to tear down those Empire Stores for an electric generating plant and at that time—that’s in what we now call Dumbo—it didn’t have a name and there was no one living down there, it was all warehouses. There was no neighborhood to get together and stop it from happening, so the Brooklyn Heights Association took over the responsibility. We named it Fulton Ferry so we got the Landmarks Commission to designate the area that we now know as Dumbo as the Fulton Ferry Historic District and that stopped Con Edison from tearing down the Empire Stores. Now the Empire Stores are still abandoned but they’re there, so I would say for the Brooklyn Heights Association that was that was a thing that I remember the most. There were a few others which at the time were big things. There’s a contemporary house at the foot of Remsen Street and Columbia Heights. There had been a house there and it was torn down long before I came to Brooklyn Heights. It was a garden and somebody bought the garden to build a house. It was a very nice architect, he was a very good architect but he was a contemporary architect and he designed a very beautiful Hampton Southampton type house. And so I was sort of the broker between the Brooklyn Heights Association, the Landmarks Preservation Commission, and the architect, and came up with a design that, as in most compromises, no one likes, but it’s still there. Q1: How did the BHA Landmarks Preservation Committee come about and why? Rosenberg: I don’t know how it came about because it was already there and I never learned the history but I will assume that the Brooklyn Heights Association’s interest in landmarking came before its interest in the neighborhood as a whole, because from what I understand it’s the oldest neighborhood association in New York. It dates back to the early 1900s. I have no idea what its focus was at that time but the focus in modern day, that really put it on the map, was getting Robert Moses to change the Brooklyn Queens Expressway which was supposed to go through the Heights like it goes through Cobble Hill. They got it to skirt the Heights and then it went through Cobble Hill. That was obviously a preservation oriented thing so I’m sure it was the committee that was responsible for that going on. The ironic thing is the Brooklyn Heights Association gets credit for this, but they didn’t do it. Once the expressway was built around Brooklyn Heights instead of through, it was Robert Moses himself who came up with the idea of the promenade. Now everyone thinks it’s the Brooklyn Heights Association that did it. We never did anything to dispute that and it was nice to be responsible for that, but it was actually Robert Moses whom everyone hates—it was his idea. Q1: Could you tell me a little about the relationship between the Brooklyn Heights Association and Jehovah’s Witnesses during your time there? Rosenberg: Okay. I would say during my time there is when it started to go downhill. Well, actually before my time it had already gone downhill. I don’t know how they did this, I wasn’t there, but they demolished some brownstones and built some redbrick buildings that tried to relate to the size and shape of the brownstones. That had already happened. I know that the people of Brooklyn Heights were not happy but what really made the relationship hard was, while I was there, they wanted to tear down a few brownstones to do the same thing, only they were told they couldn’t do it. Well, in the middle of the night they started tearing down the brownstones and then the Brooklyn Heights Association went to the Buildings Department [New York City Department of Buildings] the next morning and got a stop work order. Meanwhile the brownstones were half torn down. Well, I don’t know about half but they were damaged. It was the back of the brownstones so a compromise was made where they could continue tearing down the brownstones but they had to keep the façade and build a new building in the back of the façade, which is still there. That’s the way it is now, so I would say that was the beginning of the end of good relationships. I would say something was going on in Brooklyn Heights at the time where there was a lot of crime and it emanated from some of the larger hotels that were used for welfare, the SROs [Single Room Occupancy]. It was going on all over the city during the [Edward I.] Koch administration. One of the SROs, where actually the Brooklyn Heights Association has its offices, is now a senior citizen hotel. As time went on, the Jehovah’s Witnesses bought the others, cleared them out, and made them their hotels, so in a way that improved the relationship with the Jehovah’s Witnesses. The neighborhood then had a sort of half and half relationship with the Jehovah’s Witnesses—they didn’t like the Jehovah’s Witnesses because they didn’t give any business to the stores because they were self contained and they bought all the food and stuff from the farms upstate and they didn’t hire any workers but they stopped the crime problem single-handedly. Q2: So what are your thoughts on their continued influence in Brooklyn Heights? Rosenberg: No, it’s not the Hotel Margaret, As far as I know, if the Jehovah’s Witnesses own it, they didn’t own it when I was at—I know it’s on Clark and Henry I don’t know what it was called. Q2: Was that the [Hotel] St. George? Rosenberg: No, the St. George is at Clark—actually, the St. George is at Clark and Henry. This was at Clark and Hicks. I’ve been away too long. Anyway, they did a very good job with renovating the hotels so I don’t know. As long as they weren’t trying to tear anything down and they stopped doing that I had no strong feelings one way or the other. The ironic thing is Brooklyn Heights is one neighborhood where they would come ring your bell Sundays. Q2: Could you tell us about BHA’s involvement in the Hotel Margaret? Rosenberg: There were two big fires in Brooklyn Heights while I was there; one was an annex of the St. George Hotel and that one was a big fire but it didn’t emotionally affect people because most people had no affection for the St. George Hotel. That was an eyesore and the worst SRO in the neighborhood. But the Margaret was a nice looking hotel. I think it was probably used for a long time. I mean, people were living there it wasn’t a real hotel, I’m not sure. When that burned down it was like everyone in the Heights lost their elder and I never I never felt anything like that when a building burned down. I never realized you could feel that the loss of a building could affect you so much and it did everyone in the Heights who was interested in preservation. So then there were a lot of plans on building a new one and at first the same thing happened as with that new house at Remsen and Columbia Heights. The first plans were terrible and as time went on the Heights Association was the go between the Landmarks Commission and the architects and I think more people were happier with the results of the Margaret than that house. Q2: Could you elaborate a little on the evolution of your role in the BHA during the time that you were there? Rosenberg: Well, what happened with me is that as I was head of the Brooklyn Heights Association. Kent Barwick was the president of the MAS [Municipal Art Society]—this was before he became Landmarks commissioner. I have no idea why he did this; I don’t even remember how I knew him. He had started the Historic Districts Council [HDC] and their main object was to get the Landmarks Commission a bigger budget. Then it became dormant and he came to me and asked if I would reactivate it so I reactivated it and I wouldn’t be surprised if at that time I started spending less and less time with the Brooklyn Heights Association only because I started spending more and more time with the HDC. So I would say my relationship with the Brooklyn Heights Association on the surface stayed the same; I remained head of the Landmarks Committee until I moved from Brooklyn Heights but I really think I was putting less energy into it. Q1: You’ve continued to be involved in preservation outside of Brooklyn Heights. When did you shift your focus away from Brooklyn Heights? Rosenberg: Well, a few things happened. First of all, I was teaching in St. Ann’s School in Brooklyn Heights. I was teaching medical biochemistry and chemistry biology and while I was there, Kent Barwick became head of the Landmarks Commission. He knew that my real passion was movie theaters so when Rockefeller Center announced that they were going to demolish Radio City Music Hall, Kent came to me and asked if I would do the designation report, but also galvanize a group of people who would put pressure on him to designate it as a New York City landmark. Nelson [A.] Rockefeller, who owned the building and had been vice president and governor and had a lot of political power, got Koch to put pressure on Kent not to designate the Music Hall. So Kent needed a group and publicity to force him so that he could say, the public is up in arms, I have to have a hearing. Of course that was right up my alley so I worked on that, and then I started a committee called the Showpeople’s Committee to Save Radio City [Music Hall] and we got it designated. Shortly after, the owner of the New Amsterdam Theatre on Forty-Second Street announced that he was going to demolish his theater, so Kent asked if I would work on that, which I did. It got designated. Meanwhile, I’m going off between the Historic Districts Council and the theaters, I’m going off in directions beyond Brooklyn Heights. Then after the New Amsterdam was designated it was announced that they were going to demolish five theaters for the Marriott Marquis Hotel. Three of them were Broadway theaters, one was a movie theater and one was a store but it still looked like a movie theater inside so I started with [Actor’s] Equity and we started an organization called Save the Theaters. We lost. The theaters were demolished and the Marriott Marquis was built. Kent was very embarrassed and he knew it was wrong, but he was told to lay off and let it happen and he had no choice because his commission would have lost all funding. So he said what can we do to right the situation, and I said well, you could let us work on the designation of the remaining theaters, and he said fine, and that became the Save the Theaters Incorporated. We switched from trying to save those five theaters, which we failed to get, to getting the remaining theaters designated. Anyway, I don’t remember the timeline but I was probably still involved in Brooklyn Heights and at the same time I was starting my business. Q2: What was your relationship with the Landmarks Preservation Commission while you were at BHA? Rosenberg: With the Brooklyn Heights Association it was very good. With the Historic Districts Council it wasn’t. By that time Kent was already head of the commission and he wanted it activated because he wanted the Historic Districts Council to be a thorn in his side. He felt that the Municipal Art Society, which he had come from, was becoming less involved in preservation and more involved in the city as a whole, and he wanted to have an organization that was focused on preservation and would keep after him. I don’t know exactly what was going through his mind, but I think just like with allowing the five theaters to be demolished for the Marriott Marquis or to allow Radio City Music Hall to be demolished, Kent knows he didn’t want that to happen. He wanted to have an organization that would stop him from doing things he didn’t want to do but he had to do. This is just my take on it. He wanted the Historic Districts Council to be to keep the Landmarks Preservation Commission on its toes, which means that the Historic Districts Council has never had a good relationship with the Landmarks Preservation Commission. So when I was with Historic Districts Council my relationship was far different. When I was with the Brooklyn Heights Association I was in the same bed as the Landmarks Commission; there were no problems. It was always either trying to get a compromise or we were on the same side, we really didn’t have any differences. Come to think of it the biggest difference was there was an old wood house on Joralemon Street. There was an old man living on the street in the house and he was letting it fall down around him. The [New York City] Landmarks Law specifically says it can prevent an owner from allowing the owner’s building to be demolished by benign neglect. We pleaded with the Landmarks Commission to somehow force this guy to stabilize the house and they wouldn’t do it. Their philosophy was that even though the law says they could do it they felt that if it ever went to court and the owner of the building said, I don’t have the money, the court would side with the owner of the building and the city would lose. The city didn’t even try at that time and I don’t know what it does now. That was the major time that we had friction with the Landmarks Commission; other than that there were no problems. Q2: So the hardship application was in existence then. Rosenberg: Yeah, the Landmarks Commission was really afraid of that. I remember the Lutheran headquarters [United Lutheran Church House], the brownstone in the back of the Morgan Library [& Museum] that the Morgan Library now uses as a bookstore. They pleaded hardship and they took the Landmarks Commission to court and they won. Then there was a mansion at Twenty-Fifth [Street] and Madison [Avenue] right across the street from the courthouse and they pleaded hardship and they won. There’s a tall black building that was the mansion of Jennie Jerome [Churchill], the mother of Winston [Leonard Spencer-]Churchill that the Landmarks Commission lost and then they lost a mansion at Seventy-Ninth [Street] and Fifth. Those three losses got the Landmarks Commission to stay away from stuff like that. Q1: Did any other preservation or community organizations come to the BHA for help with their own causes? Rosenberg: I would say no but once the Historic Districts Council began they would go to the Historic Districts Council because one of its main purposes was to encourage neighborhoods to go to them. The Brooklyn Heights Association took over the work for Fulton Ferry but Fulton Ferry never came to the Brooklyn Heights Association to ask them to do it because there was no one down there. 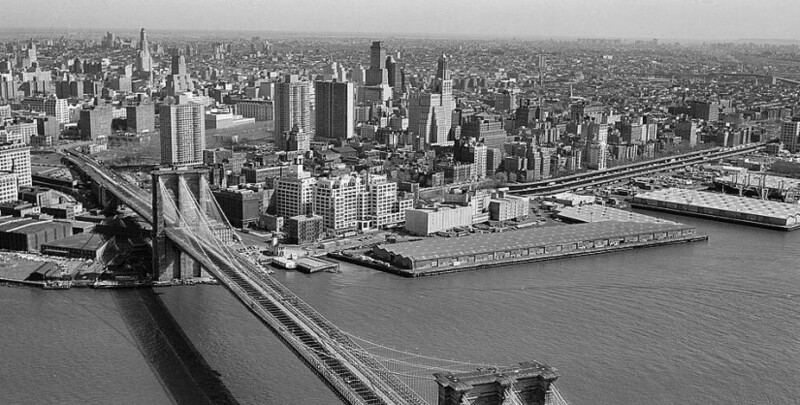 Q2: Did you feel that Brooklyn Heights was a world apart from other Brooklyn neighborhoods? You mentioned Cobble Hill. Rosenberg: Definitely. I think less so now because everyone wants to live in Park Slope or around Fort Greene but at that time Brooklyn Heights was separate. They never wanted to be considered part of Downtown Brooklyn even though Downtown Brooklyn was right next to them. They were definitely an insular community. Q1: Did you take away any lessons or specific tools from your experience in Brooklyn Heights that you would use in your later advocacy? Rosenberg: Well one of the biggest tools was an accident. I was still teaching at St. Ann’s and I was giving pro bono tours for the Brooklyn Heights Association as a fund raiser. I didn’t know it but one day the president of American Express was on my tour and after the tour he came up to me and said, “You know I have visitors all the time in New York and I want them to see New York and enjoy New York but I don’t want to show it to them. Can I hire you?” I said sure and he said it would make it much easier if I started a business so he could contract me. So if I hadn’t been giving tours for the Brooklyn Heights Association I wouldn’t have the business I have now. That’s something I took away. My initial contacts with the Landmarks Commission came in handy with the Historic Districts Council and then they came in very handy with Save the Theaters. I’m still friends with all these people. When I was with the Brooklyn Heights Association, my relationship with the Landmarks Commission was very good. The Historic Districts Council has always had tension with the Landmarks Commission but I don’t think I personally felt it even though I was president. What else did I take? I took with me guilt when I moved to Manhattan. I felt like I was abandoning ship. Q2: Did the character of Brooklyn Heights change in the time that you lived there, between the ‘70s and the ’90s? Rosenberg: Yes. One of the reasons we moved to Brooklyn Heights was that it was less expensive than the Upper West Side and Greenwich Village, so of course one thing that’s changed is that now it’s not. It had a higher crime rate than other neighborhoods in Manhattan because of the SROs. You felt more of a distance between Brooklyn Heights and Manhattan because the subways were weren’t as safe and efficient as they are now. Now you don’t think about using the subway alone at any hour, but back in the ‘70s you did. And really you still did it but it added a tension that you don’t feel now. I’d say the quality of life in the neighborhood is much different now it is in all neighborhoods but it’s a lot different. It had a much larger gay population in the ‘70s and that ended when it became expensive. I think that was a big loss. P.S. 7 [Samuel Stern] parents would not send their kids there, either to private schools or because they didn’t live in Brooklyn Heights and I think that’s changed. There have always been people upset with chains store—chains moving in and mom and pop stores moving out but this was back in the ‘70s and everyone thought that in the ‘70s there were too many chains moving in so it’s all relative. The Heights went through periods when there were a lot of empty storefronts, which I don’t think exists now. A lot of houses that were rooming houses when I moved in are now single family houses. I would say there are probably more families living in Brooklyn Heights now. Q2: How did the membership of the Brooklyn Heights Association evolve through these changes? Rosenberg: I don’t know if I can answer that because I don’t know if I know the answer. My perception is that the numbers have stayed the same all through the years but the makeup of the people, and the board of directors hasn’t changed a bit. They’re all wealthy activists and parents of kids who go to private schools and I don’t think that’s changed. When I go down the list I don’t know a lot of people now on the board of directors but it just seems that way from the people who I still know. I think that the Brooklyn Heights Association is more active in larger things like the Brooklyn Bridge Park. There was a time when they were going to work on the Brooklyn Queens Expressway so that work would be rerouted through Cobble Hill and the Heights Association was very active in that. They were active in the Internal Revenue [Service] building and the courthouse even though it wasn’t Brooklyn Heights so they’ve become more and more active in things outside of the Heights. Q1: There is still debate today over how to reuse Empire Stores. The planning of Brooklyn Bridge Park is also having an effect on the Fulton Ferry landing. Do you have any thoughts on that? Rosenberg: Here are my thoughts on the Empire Stores; you know, I give advice about saving historic theaters and one of the hardest things is to convince people that even though every theater is worth saving, if you’re going to save it, you have to use it and you have to make money. Either that or be a nonprofit and get enough money from donations. But you have to know what to do with it. Saving it is the easiest part and using it is the hardest part and of course it’s very hard to come to the conclusion that a building has to go because there’s no use for it. The Empire Stores were saved every time someone came up with a use for it, it never worked out. Personally, I feel that unless there is dependable boat service between the Empire Stores and Manhattan, probably South Street Seaport, nothing is going to happen. It would be so expensive to put something in there and they’re going to have to make money from it. You’ll need a volume of people, which of course Dumbo will hate, but it’s the only way to get those people. The F train is not convenient and to be truthful, the taxi service between Fulton Ferry and Manhattan hasn’t been successful. I don’t know. I don’t have much confidence that something is going to happen there soon. Q2: And Brooklyn Bridge Park? Rosenberg: Just from seeing what is being done now I think it’s really being done well. I think it’s going to be one of these things like what’s already been done closer to the Manhattan Bridge. Not many people know about it, not many people take advantage of it considering the cost but it’s wonderful and I think Brooklyn Bridge Park might end up being the same thing. The few people who go there are going to absolutely love it and say, my god, the city’s brilliant in doing it, and the majority of people aren’t going to know it’s there. In people’s eyes it’s isolated so how would they know about it? August barge [phonetic] how many people know it’s there? You don’t accidentally take the A train, get off at High Street and accidentally walk down to the river and discover it. Q2: Are you still involved in preservation? Q2: Yeah, renovation was begun on it recently. Rosenberg: I don’t know. The funny thing is I just got a notice that it was going to be open for viewing April First. I think it might have been designated a landmark or it’s close to being designated a landmark but I would say no, I’m really not actively involved in preservation. Q2: I’m curious as to whether you think that Brooklyn Heights in terms of a historic district is kind of a foregone conclusion, that there won’t be any more threats to it and that its character will not change. Rosenberg: Well, I think there haven’t been threats to it for a long time because it’s a self-contained area, and it has a strong neighborhood association and the Landmarks Commission has teeth and the preservation law has teeth. There’s also the height limit so no, I don’t think it’s in danger. Socially? You never know what’s going to happen because the in 1970s no one ever dreamt that New York would be as a nice a place to live in as it is now. You know, when I was working on the designation of the Forty-Second Street theaters I was asking myself why am I doing this because I would look out at Forty-Second Street and I’d say there’s no hope for this street. We can stop this theater from being demolished but it’s going sit here empty because no one is going to come to this theater because no one is going walk down Forty-Second Street. I was right for twenty years and then in 1999 Disney opened up in the New Amsterdam after renovation and about a year before that the New Victory [Theater] opened up and that changed everything but who would have guessed? When things were really bad you could not picture New York being the way it is now because in the seventies it was going downhill and it was going to continue to go downhill. When you look at things that are good you really can’t imagine what it’s going to be like in twenty years from now. Maybe it’ll go back to the way it was, I mean hopefully it won’t, but that’s one thing I learned from New York. Most cities have continued to go down but you just can’t predict the future. I wouldn’t want to make predictions about the Heights. I would only hope that it won’t change and a neighborhood like the Heights probably has less of a chance of changing than other neighborhoods. Q1: Do you have anything else to add? Rosenberg: No, but I’m very impressed with all of your questions, you did a lot of research. Q2: It’s a great story, it’s important to know about. Brooklyn Heights is different. Rosenberg: Yeah, it really is a different neighborhood, it’s a very special neighborhood, and I really mean it—even today, but more so when I first moved out of Brooklyn Heights, that I really felt guilt. Q1: Thank you very much.